Fly to Paris from Dublin with Aer Lingus and immerse yourself in the Parisian way of life. Romance, history and endless charm; Paris has it all. The City of Love is home to the Eiffel Tower, magnificent art collections, fine dining and the world's most iconic shopping avenue the Champs-Elyséees. From the famous Moulin Rouge to the eternal flame under the Arc de Triomphe, the French capital is awash with history and culture. 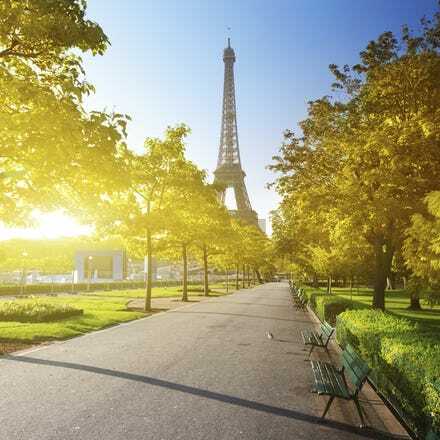 Book your flights from Dublin to Paris with Aer Lingus today. Catch a cheap flight with Aer Lingus and enjoy a quick and comfortable journey to Paris. We offer frequent departures to the French capital from Dublin Airport Terminal 2. Once you arrive at Charles de Gaulle Airport, our travel partners can offer you great discounts on rental cars, or you can catch a train or bus from the airport into Paris. Few cities can match the kind of iconic status that Paris boasts in the imagination of travellers the world over. In fashion, gastronomy, the arts, she is queen. As you visit the different 'quartiers' of the City of Lights her moods shift from gritty to sophisticated, Haute Couture to punk. Paris is a true metropolis and there is always something new to discover beyond the legendary sights and museums we all know so well. This fabled city has a way of getting under your skin and feeling instantly familiar to all who wander her hypnotic streets and linger at her inviting cafes. The main airports in Paris are Roissy Charles de Gaulle (CDG) and Orly. There’s also Paris Beauvais, which is mainly served by low cost airlines. Carrying about 64 million passengers each year, CDG is the city’s flagship airport – fly with Aer Lingus from Dublin, and this is where you’ll land. CDG airport is located around 18 miles from the city centre, so it’s easy to get into Paris. One option is the Roissybus. The journey takes roughly 45-60 minutes, and buses leave the airport every 15 minutes. There are Air France buses, too. These buses go to Porte Maillot and Etoile, and leave the airport every 15 minutes. You don’t need to be an Air France passenger to hop on one – but be warned, they don’t stop at terminal 3 (and the Roisseybus costs less). Alternatively, you can take the commuter train system (the underground RER B) to Gare du Nord. This is a little cheaper than the bus, and fast too, with a journey time of around 30 minutes. The trains run every 10-15 minutes, and you can easily transfer to the Metro network once you reach the station. Paris’s local transport is cheap, efficient and easy to use. The bus, underground (Metro) and RER systems divide the city into five zones, and tickets can be purchased from kiosks and stations. You could also opt for a travel card (choices range from one to five days), available from the airport, underground stations and tourist information offices.